So many L’s taken tonight. We should have known UFC 229 was going to be special the moment a pair of drunken couples started throwing hands at the weigh-ins. UFC 229 was finals week for Street MMA and we think every lesson was passed with flying colors. Look, there are crowd brawls at nearly every live MMA show. Don’t take your kids, grandparents, auntie or girlfriend to any MMA shows where alcohol is being served. Stuff pops off and just keep your head on a swivel whenever you attend an MMA event. 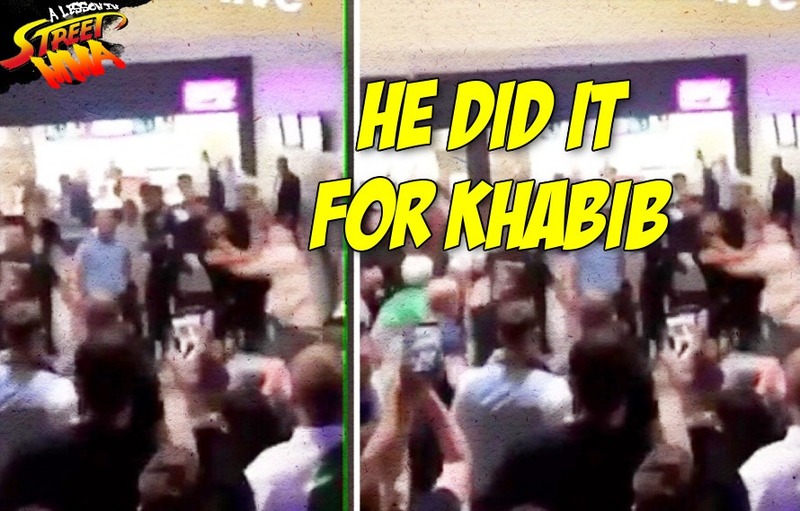 We already covered the massive Conor vs. Khabib post-fight brawl here with multiple videos and angles. But whatever happened to all those riled up Irish and Russian UFC fans as the left the T-Mobile Arena in Las Vegas? Would they go quietly into the night? Or would they try to get revenge for Conor or Khabib without either fighter every knowing or caring about what their fans do? Welp, according to this lobby fight live from the T-Mobile Arena in Las Vegas, fights were had but not much honored was involved. This looks like a drunk Conor fan and a drunk Khabib tried to recreate the UFC 229 in the lobby of the arena. The hype was there. The intros looked good. Then the bell rang and the fight was over. Less than 13 seconds! That left. Depending on which way the video was filmed, vertically by the way (smh). The final lesson in UFC 229 Street MMA is don’t be that guy who just got knocked the fook out. I present to you the UFC 229 Knockout of the Night. Front row seats to Russia vs Ireland brawl post fight.